Junk mail, which is sometimes called “direct mail,” is the advertising that direct marketing agencies strive to get you to open. All those offers for credit cards, insurance, dentists, cars, fast food, and anything else that offers direct sales, are generally fighting a losing battle to get your attention. In the past, direct mail would scream and shout the offers at you, loud and proud. Huge percentage rates on the envelopes for credit card offers were commonplace. Loud, colorful graphics and in-your-face headlines all shouted: “free, look at me, read me, open me, don’t ignore me!” It was the epitome of junk mail. Of course, consumers quickly became savvy to those methods, and it was not difficult to spot the genuine letters and packages from the ones trying to sell something. That’s when junk mail creators became more sneaky, and started analyzing what people open, and what they throw away. It’s becoming more difficult to separate the bad offers from the good, and the personal mail from the corporate. Oh, and it should be noted that genuinely good direct mail is honest, doesn’t stoop to these tricks and will capture your attention in a positive way. But, with that said, here are the signs to look for when trying to dig out the dregs. This is the biggest giveaway of junk mail. Look in the postage area and if you see either PRESORTED or PRSRT STD, it’s almost certainly junk mail. 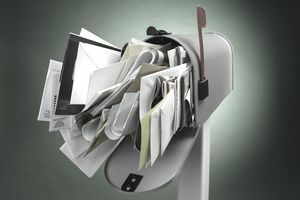 You usually need to send over 500 pieces of mail to qualify for the discounted presorted rate, and how many times do people send out that amount of mail at once? The USPS likes this kind of mail because it is already “presorted” into zip codes, hence the discount for time saved. It used to be easy to spot this presorted mail, but once again, both the USPS and the direct mail agencies are looking for new ways to get past your guard. Now, junk mail can feature an actual postage stamp, although if you look closely you will still see PRESORTED or PRSRT STD printed somewhere on it. Junk mail can also feature metered postage (that red or black looking mark made with ink) but again, look for the telltale words. Oh, and anything important, such as personal correspondence, is never sent presorted; if you see something that looks like a check or a bill, it’s not. Another dead giveaway of junk mail is the desperate attempt to look like it has come from a real live person. For this reason, direct mail and junk mail is starting to imitate the mail we receive from friends and family, but at the moment it’s not difficult to tell them apart. First, genuine handwriting is never on perfectly straight lines. So, that right there is a huge indication that you’re about to open a crummy offer. However, recently there have been attempts to offset the lines to mimic real handwriting. There are other clues you can look for. One of the big indicators is the identical letters used in the name and address. As real people, we never write any two letters exactly the same. But the fonts used to generate these letters are identical. Or, 99% of the time there is. Now, some fonts feature 3 or 4 variations of the same letters, to convince people that the handwriting came from a person. In that case, look at the pressure used, and the variation in the color of the ink. Real handwriting creates dark and light shades of ink, and the pressure of the pen on the paper leaves indents. If that too has been mimicked, you should definitely open this piece of mail. Anyone who went to that amount of effort to trick you into thinking it was written by a real person clearly has something interesting to say. And how long does it take to open an envelope anyway? Anything telling you that time is running out, or you must open the letter quickly, is guaranteed to be a piece of junk mail. These kinds of statements are tacky, and if you genuinely owe money to someone and have very little time to pay, they’re not going to send you a letter via presorted mail. In fact, the first communication will usually be an email or a phone call, because it’s cheaper and more reliable. Sometimes, a real institution will send you a communication that is actually telling you time is running out to pay something or file paperwork. However, they will not advertise this fact all over the envelope. They may use a different color for the envelope than their usual correspondence (for instance, some institutions use yellow or red envelopes for overdue bills), or they may print in a different colored ink. But the warnings will never be slapped all over the letter or package. A genuine piece of correspondence from a financial institution does not go out of its way to look this official and scary. Most of the time your bank will just mail you a letter with your name and address on it. These warnings, seals, eagle heads, and other official-looking symbols are all designed to make you think this is an important piece of mail you must open. Don’t open it. Throw it away. It’s junk.